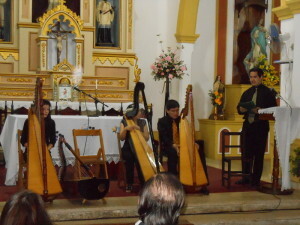 One of the country’s leading harpists, Marcos Lucena, started off our harp classes in Santa María, with costs shared between SMEF and the foundation Sonidos de la Tierra, with the project of teaching both the baroque music that is our heritage and the popular folk music of the present day. His star pupil from the next town, Victoria Oviedo, soon took over the classes and has brought up a group that now play well in public. Meanwhile, Victoria’s own musical career has blossomed as she forms part of the French group Les Chemins du Baroque as well as the group Paraguay Barroco. She is now the first harpist in Latin America to play the baroque harp, which has strings that cross over, producing the full range of sharps and flats – unlike the traditional Paraguayan harp, which is tuned into just one key. Thanks to Sonidos de la Tierra, we have had violin classes in Santa María for around fifteen years, but recently Sonidos has been reducing its support and now our violin classes are financed exclusively by SMEF. Our teacher is the distinguished violinist Luis Graziani (pictured right of centre in a white shirt), who comes from Asunción once a month. He is a member of the National Symphonic Orchestra and a teacher at the National Music Conservatory, specialising in the viola. In the intervening weeks our leading pupil here, Jesús, leads the class. We also support Jesús and another of our top pupils, Sebastián, in private violin classes in Asunción with the Uruguayan maestro Gerardo Gramajo. In the past we have also supported other music classes as and when our volunteers can teach them, such as musical theory, singing, piano and recorder classes. 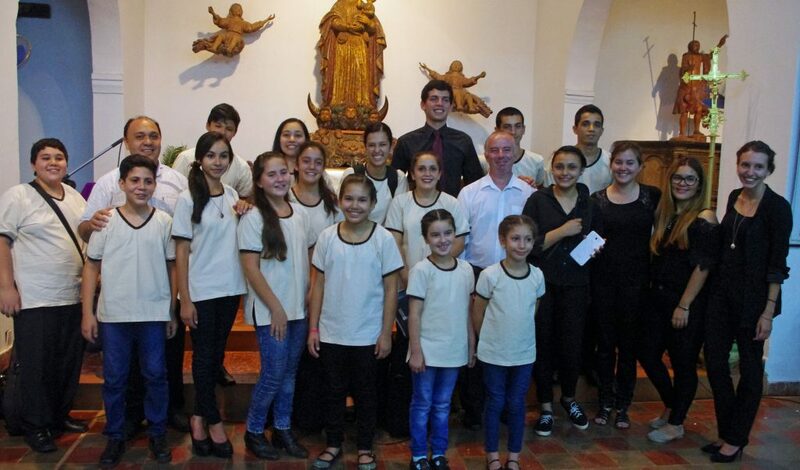 We have also support singing classes by the Paraguayan soprano Cristina Vera Díaz, who trained in Paraguay, Argentina, Switzerland and Hamburg, and who sings frequently with the Orquesta Sinfonica of Asunción.